TechTalk Now you can connect New Portable Display to your Android phone. Now you can connect New Portable Display to your Android phone. 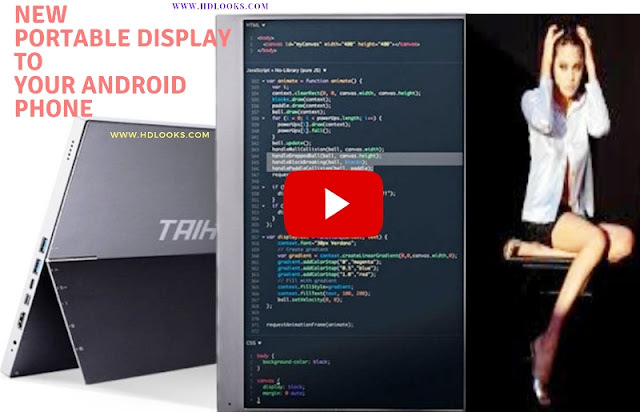 Do you want to connect portable Display to Your Android Phone? Launch New Portable Display. USB Chub is a must-have accessory, if you own a MacBook pro or the most recent 2018 iPad pro. Unfortunately, Apple doesn't include it on the box and it's really costly to buy on their official stores and online. Don’t worry here is a cheaper alternative that costs only $32. If you’re in the market for a portable display, UNICK promises to deliver the most affordable option with the Gemini. The Gemini is a 15.6-inch portable display with minimal top and side bezels that comes in two versions: one with Full HD resolution, and a second with 4K (3,840 x 2,160) resolution. Thus, the full HD version is touch-sensitive, whereas the 4K version is not. That said, the 4K version covers 100% of the Adobe RGB color space. The full HD version only covers 72 % of the NTSC color space. Even port selection somewhat differs across both versions. The full HD version features one USB-C port, two mini USB ports, and 2 mini HDMI ports. The 4K version features 2 regular USB ports, one USB-C port, one mini Display Port, and one HDMI port. The ports allow for plenty of flexibility in terms of device support. Thanks to the USB-C port, you'll be able to connect your android smartphone to the Gemini and possible use your phone as a pc on the go. Of course, you can also use the Gemini as a second display for your pc or your main display for various video game consoles. You’ll have to pledge at least $189 for the full HD version or $269 for the 4K version. With over $150,000 already collected, the Gemini is well on its way to becoming a successful Kickstarter campaign. Backers should get their displays sometime in might 2019. As usual, be somewhat wary of crowd funding campaigns. Not all of them end up in backers’ hands, even when campaigns ended up being successful.